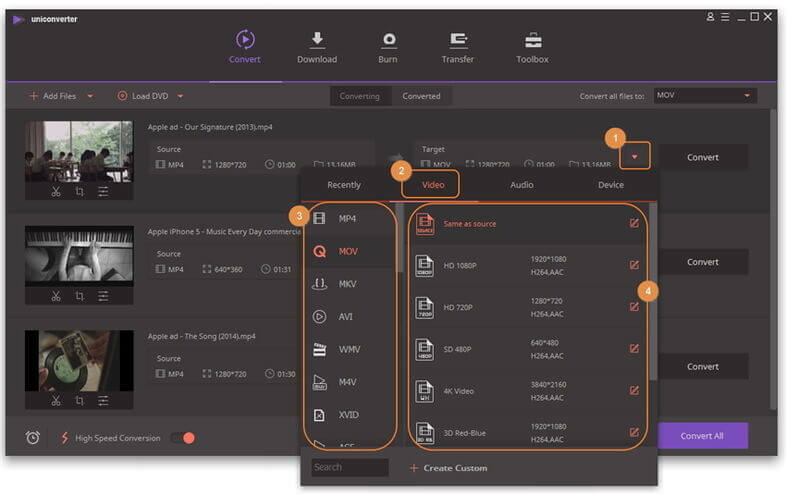 MOV is not just a video format but a generic format that stores various types of data. As a result, the MOV format that stores data in one system may not run comfortably in another system due to the lack of proper codecs or program to run the file. So it’s not surprising to see people search ways to convert MOV to QuickTime. Some formats that belong to the MOV container cannot be played by the QuickTime is mainly caused by the fact that the compression codecs are either not installed or they are not upgraded in the timely manner to get the needed services for which the QuickTime is known for. Basically, there're 3 major reasons causing people convert .mov to MOV people convert .mov to MOV the main reasons to convert .mov to MOV are listed as follows. To update the file to latest format. To be able to play all the videos at high quality. For editing them on high-end software like iMovie or Final Cut Pro. It is therefore important to convert the MOV to latest QuickTime version to enjoy the same benefits. This section of the tutorial will introduce the most excellent and the most advanced program to be certain that the user gets the finest outcome. The top way to get the state of the art service is to convert the format to the one that is generally played by all the QuickTime players irrespective of their version. In order to get the things done the next part of the tutorial is recommended to the reader that is to be followed for the result that is required. Wondershare UniConverter (originally Wondershare Video Converter Ultimate) is the finest converter that is available online to ensure that the user gets the conversion experience that is also fast and reliable. It also provides provides minor editing of videos like changing the orientation, trimming the video, etc. 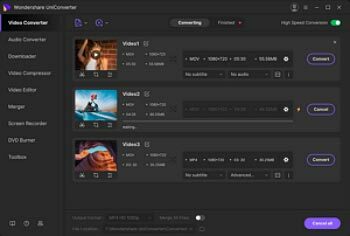 You can also add effects and watermark to your video with the software.The process of converting from MOV to QuickTime related format is very simple and the steps below are to be followed to so that the user gets the results. Step 1 Download and install the program, click Add Files to add the .MOV files you want to convert. Step 2 Click the icon from the Target box and select Video tab, choose MOV in the left sidebar and select the video resolution in the right to confirm the output format. Step 3 Click the Convert button when everything is set and the conversions will be completed automatically. There are many methods to convert an old MOV to new MOV and we will start our discussion with the best tool that is available online. Free MOV to MOV converters are both easy to use and free of cost. With that in mind, we'd like to introduce CloudConvert.com here. It is home to over various conversion engine that can convert formats over 218 types without any cost. You can upload multiple files for conversion at the same time and download the converted files without any problem. CloudConvert uses the power of cloud computing that makes it easy to get converted file faster. It also comes with a powerful API that lets you integrate the site with your product effortlessly. 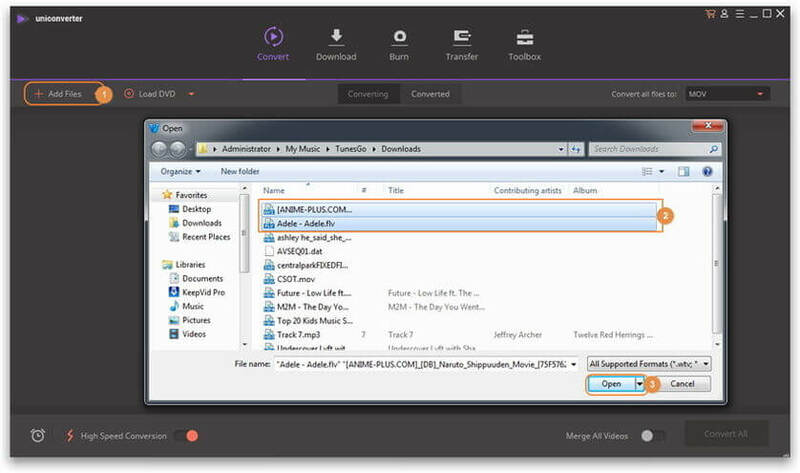 Here is how you can use the online MOV to MOV converter tool. Step 1. Go to the site: https://cloudconvert.com/mov-to-mov. Step 2. Click on Select Files button to browse through local files. For any other source, you can click on the drop-down box and get files from URL, dropbox, google drive and others. Step 4. Click on download button to download all the converted files. Constant need of internet connection. Not much control over the output file quality. Wondershare Video Convertor Ultimate is a one of a kind program that has been developed keeping in view the needs that are arising in the wake of advancement in science and technology. It is highly recommended to all the users who face issues that are discussed in this tutorial making a way out for them without any issue and trouble. The program and the related features are simple stunning and therefore it should be kept as a part as a PC running any OS is simple incomplete without the use of this program. > Resource > MOV > QuickTime Converting .MOV to MOV? Is it Crazy!